This coming Sunday is arguably the most important day of the year in America. It is the day when companies pay millions of dollars just to have a 30 second ad played on TV ($5 million to be exact[i]). It is easily the world’s most valuable sporting event, bringing in almost $250 million more than the second most valuable, the Summer Olympics. [ii] Last year’s Super Bowl had a total of 111.3 million viewers,[iii] while Super Bowl L had a total of 114.4 million viewers, the most on record. In fact, of the top ten most watched television events in US history, nine of them have been Super Bowls (kudos to M.A.S.H for being up there). [iv] Suffice to say that the Super Bowl is the largest event to occur in America every year. This also makes it the largest religious event to occur in America every year. Before I go any further, let me say that you will not find a bigger sports addict than me. I can name almost the entire Chicago Blackhawks roster from 2006-07 (my favorite player was Karl Stewart, but I know you don’t care). I cried back in 2003 when the Cubs blew a 3-0 with 1 out in the 8th inning of Game 6 of the NLCS. I also cried the night they won it all: November 2nd , 2016 (technically November 3rd, but whatever). I played baseball from the time I was four years old to the age of 21, finally playing my last game in May of last year. I have attended baseball, hockey, football, and basketball games throughout my entire life and I have played fantasy sports every year for the past ten years. As a kid, I had a shirt which said: “Baseball is Life. Everything Else is Just Details.” For most of my life, I lived as though that statement were true. In my final years of baseball, I began to see the sport through the lens of my ongoing theological training. The tension between sports and my Christian faith had been growing in me for quite some time, but it was the classes I attended which provided the framework for which to understand it. I took Christian Ethics, Comparative Religions, History and Theology of Worship, along with historical classes and Bible classes which helped me understand the world in which the New Testament (specifically) was written. I came to learn that idolatry is not about worshipping a statue: it is dedicating the fullness of your life to something that is not Christ. It is devoting yourself to a worldview which is not in line with the cross of Jesus. It was a short time ago when I learned that sports had become my idol. It was what defined me most of all: I was an “athlete” and a “baseball player.” My entire life was lived under the lighting of sports. Everything else in my life was merely details. This may seem like a personal problem, but I have come to believe it is much more than that. Like anything in this world, sports has a narrative which it invites us to participate in. It has a worldview which it asks us to adopt before we can begin to understand it. It has rules which we must follow if we are to continue in our pursuit of it. It trains us to desire what it defines as valuable and subsequently tells us how we are supposed to live our lives in order to achieve it. It demands our allegiance and shames us if we deter from the path. It changes the way we look at ourselves and the way we look at others. It gives us examples of its “greatness” and encourages us to follow their example. In every aspect of its existence, sports challenges God for authority and offers itself as an alternative to God. Sports is a religion, and in the context of Jesus Christ, it is a false religion. Every religion has a liturgy, and every religious service has its own take on its respective group’s form of worship. What I am going to do in this post is explore the liturgy of the Super Bowl in order to show how the imagery, the structure, and the content of this game teaches us to view the world in a certain way. We will examine the similarities between the game and a religious service, and highlight how the movement of the event creates, reinforces, and gives us space to practice the worldview to which it ascribes. Ultimately, I will argue that the message which the Super Bowl presents has religious and political implications which stand opposed to the Good News of Jesus Christ and the example which he has given his followers to replicate. The football stadium is designed like many places of worship, with the holiest place being the center and the level of holiness decreasing as it extends outward. In the Jewish temple, the outer part of the temple was a place for all worshippers, Jews and non-Jews alike, but there was a certain gate through which only Jews could pass through. Within that gate, there was an area for women, then a section for only men, then only priests, then finally near the center was the Holy Place, where a priest entered once a year to offer a sacrifice for the people (This is what Zechariah is doing in Luke 1). The Holy of Holies sits in the center, but worshippers and priests were forbidden to enter. While the Jewish Temple separated people according to race, class, and gender, a football stadium separates people by another standard: wealth. At the time of this writing, front row seats to the Super Bowl are going for as much as $28,000 on NFL Ticket Exchange. Only the most prosperous and most dedicated followers will buy seats closer to the field, but to even buy a “nosebleed” ticket to the event is a proof of loyalty – the cheapest seats I found were for over $3,000. The entire football stadium is itself a display of great wealth. Many new facilities, including the one in Minnesota where the Super Bowl is being held, feature state of the art architecture. There is a retractable roof overhead for both indoor and outdoor games, a giant Jumbotron for fans to watch replays and hype videos, box seats with numerous amenities, a field which features the most advanced form of Astroturf, and stores/vendors which line the outer corridors. These stadiums reflect just how much money people are willing to invest in their team and their sport. In Christianity, priests adorn robes and sashes which are meant to convey a certain meaning, given the time of the Christian calendar. During the Hajj, Muslim men wear white robes in order to make the journey to Mecca. In any given week, each specific religious gathering requires the congregants to wear an outfit which is suitable for the congregation. In some Catholic churches, this requires a suit and tie; in many modern Evangelical churches, you can wear a t-shirt and jeans. In my opinion, one of the scariest parts of attending a new congregation is not knowing what is appropriate to wear. We want to fit in and look the part: we do not want to be underdressed, but we certainly do not want to be overdressed. When attending a football game, you will see many jerseys of each team, some of current players and some from the past. Every fan’s loyalty is determined by the color of their outfit (it will align with their team’s colors), and their level of loyalty is established by how much they wear. Some fans will take four or more hours to prepare themselves with body paint and attire. Some fans will show their support by being rowdy in the belief that it is the loudest and most decorated fans who show the most loyalty to their team. Much as the Catholic and Orthodox churches honor saints of the religion – such as Augustine, Nazianzus, Gregory, and Aquinas – football honors the legacy of people who have been stars of the game in the past. Statues are built outside the stadiums of the teams who had the honor of having a saint wear their jersey. These people are given the utmost respect in their hometowns, often not having to pay for meals, and they are remembered through TV shows and video highlights of their greatest moments. In Chicago, players like Walter Payton have statues in their honor, and if you ask anyone who Mike Ditka is, they will probably know (true fans will refer to him as “Da Coach”). Current players are honored by the numerous jerseys which line the stands. It will be impossible to count the number of Tom Brady jerseys you will see on Sunday night, as he is generally understood to be the greatest quarterback of this era. Thousands of kids watching the game will have hopes of being Tom Brady, and if they are anything like me, they will emulate him and daydream of the possible moment when they get the chance to do what he does. These are the saints who the faithful aspire to be like. These are the men whom we gladly follow and worship. I will reiterate: the liturgy is the most important part of any religious gathering, because it teaches us what to believe, how to believe it, and how to act it out. This is done through repetition of certain mantras or songs, standing in moments of praise, sitting in moments of reflection, partaking in different ceremonies (such as the Eucharist and baptism), and interacting with those who hold the same beliefs. Each of these elements is infused with a certain meaning which contributes to message of the whole service. Those who know these meanings, what I call the “rules” of the liturgy, will have a greater experience and understand the message in greater depth than those who have not been trained in it. Football has a complex liturgy which also must be learned before it can be appreciated. The first aspect is the tailgate/hype. The tailgate provides an opportunity for fellowship which strengthens the bonds of like-minded fans. This is done through crazy antics, fun party games, and a growing distaste for the opposing team on that day. Once inside the stadium, anticipation of the event grows as people have an opportunity to takes pictures as close to the field as possible, as well as watch the JumboTron, buy souvenirs and food, or even try to get an autograph from a player on the field. The National Anthem signifies the start of the game, and all fans rise, remove their hats, and remain silent. During the game, the entire crowd will rise for the kickoff and cheer following the first tackle. When the home team has the ball on offense, the home crowd will stay silent to allow the players a chance to communicate with each other, but they will rise and cheer for any important plays that happen. When the opposing team has the ball, the home crowd will get as loud as possible in the hope that the opponent will make a mistake because of it. Silence occurs when the opponent scores a touchdown or a field goal, while joy and elation fill the stands when the home team scores. Opposing players are jeered throughout the game, while bad decisions on the part of the home team also take their share of scorn. Near the end of the game, if the score is close, fans of both team will focus intently on every play. Every positive action will be met with loud applause, as the crowd attempts to will their team to victory. The crowd will stand on their feet in big moments, and when the game-clinching play finally occurs, the fans of the victorious team cheer in celebration, while the other fans sit in silence or simply leave the stadium. 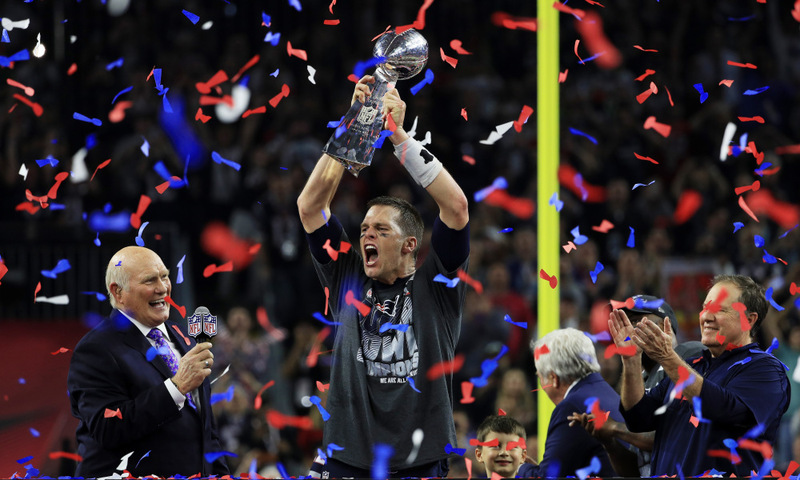 In the case of the Super Bowl, once a victor has been named, a large podium is brought onto the field while confetti rains from the ceiling. The champions are given t-shirts and hats commemorating their victory, while the owner, coach, and MVP of the game are brought onto the stage to receive their awards. The most iconic moments in football are photographed here, as players get to hoist their championship trophy for all of their dedicated followers to see. Speeches are made, champagne is brought out, and a party occurs on the field, in the locker room, and within every household who supported them along the way. The losers are often forgotten, only to be remembered if their defeat was utterly humiliating (“the Falcons blew a 28-3 lead”). I have attempted to reveal the similarities between football and organized religion. Each religion ascribes to a certain worldview, and this will be evident in their respective gatherings. So what does football, and more specifically, the Super Bowl, teach us about life and how to live it? Success = Wealth and fame. According to Football, the highest honor that one can obtain is winning the Super Bowl. It is in that moment when your fame reaches the utmost, as you will be pictured on magazines and newspapers. Those who play the game the best will not only receive this glory, but they will get large contracts, opportunities to be featured in commercials, expensive houses and cars, hot wives, and maybe even have a statue erected in their honor. Tom Brady is the perfect example of this ideology. From a young age, kids are not only encouraged to be like these athletes, but to mimic them. By wearing a player’s jersey, a fan shows that this player is worthy of emulation. It provides the experience of being like that person, which means briefly abandoning one’s ordinary life to be a part of something greater. The face paint, the team colors, the cheers: all of them are done in an effort to take part in what is occurring on the field. In the football stadium, the common is traded for the glorious. While the highest honor is to have a place on the field, football motivates us to think that even if we cannot play the game, we can still experience it closely if we have the money to pay for it. Super Bowl ads show fans where to invest their money for the best football experience and things like NFL Sunday Ticket brag that it can get you as close to the game as possible from the comfort of your own home. The stadium itself is built in a way to honor those who have money and power as all the features of a modern NFL stadium show off the wealth of the owners and investors and gives the fans an opportunity to bask in that wealth for a limited time. Success is only obtained through effort and perseverance. Throughout the last two weeks, the media has been conducting interviews of players on both teams and have given us numerous storylines to look for. In many of these stories, there is a common thread: this player who is playing in the Super Bowl had to overcome some type of challenge or hardship to get where he is. The media attempts to connect these players to their audience by promoting these storylines, and they will talk about the best players in these terms (I dare anyone to count the number of times we have been reminded that Tom Brady was a “6th round pick” in the NFL draft). This narrative reinforces the idea that no matter how famous or wealthy a player is, they too have common roots. Football tells us that if these people can overcome the ordinary life to become our heroes, then anyone can; all it takes is hard work and dedication. Just look at the story of Nick Foles, the quarterback of the Eagles: He was a “backup” and had played terribly over the past couple years, but now, "because of his work ethic," he is starting in the Super Bowl. We are encouraged to think that if we put in that extra hour at work or practice, we can advance our careers. Wealth and fame is only for those who are willing to do whatever it takes to achieve it. Football tells us that the road to success will not be easy; it will feature many hardships, especially from those who seek to throw you off of your path. In the game of football, your goal is to reach the endzone and score as many points as possible, but your opponent stands in your way. This teaches us that there are those who are different from you who seek the same thing as you, so the only way you can reach your goals is to be better than them. In this dichotomy, there can only be a winner if there is also a loser: you cannot share the victory. If Super Bowl LII ends in a tie this Sunday, there will be untold outrage against the NFL. According to Football (and sports in general), only one champion can be crowned every year. To take it even further, there can be no “us” if there is not a “them:” there is no game to be played if there is no opponent. In order for football to even exist, there must be different teams and each must stand opposed to all other teams. If one team decides to let the other win, football loses all of its glory and excitement. It hinges on competition and fighting: it deliberately creates only one prize so that only one team can win. Each other team must be viewed as an obstacle in one’s attempt to gain the glory which stands at the end of the path. Normalization of war and violence. Because of the divisive nature of football, war is a common metaphor used to describe the events on the field. The other team is the “enemy” and you score points by “advancing into enemy territory.” For the most part, violent hits are cheered, while strength and toughness is demanded of each player. Endzones must be “protected,” defenses must be “attacked,” and victors must be “crowned.” It is common to hear that a Running Back "ran through the trenches" or that a team with a formidable Quarterback has an "air raid" offense. Another way in which war and violence is normalized is through the performance of the National Anthem. While I am in full support of honoring those who have devoted themselves to doing what they believe is right and protecting what they hold dear, the way the Anthem is performed encourages more violence in the name of “freedom.” There is not a hint of regret for the lives which have been lost, both American and non-American. The performance claims that the reason we are able to enjoy the sport of football is through the just violence of war, done in order to protect the country from all hostilities. The death of an American soldier is viewed as a “necessary sacrifice” to maintain freedom, because just like in football, there is always an opponent who must be defeated in order to win the prize. From Football’s point of view, there is no option other than war when someone is against you. Allegiance to the “Team” is highest priority. In Football, the greatest sin one can commit is changing one’s allegiance. One encouraged to maintain the “faith” of those who came before, and dissenters are treated as heretics. Eagles fans must never become Giants fans; Bears fans must never claim to root for Aaron Rodgers. One must remain faithful, through both the good times and the bad, or one cannot truly call oneself a fan. “Bandwagoners,” those who support whichever team is doing well at the time, are harshly criticized and mocked for their constant changing. Fans who are struggling with remaining faithful are called to “remember the good times” and not forget the joys that the team once brought. In regards to those on the field, players sacrifice their bodies in these games in order to win, and many suffer the lingering effects of concussions and ligament injuries long after they have retired. If a player still has the capacity to play, they must persevere in order to not “let the team down.” Those who do not follow team rules are “cancers” in the locker room, and those players are kicked off if they do not live up to the standards. If one player leaves a team to join a rival (James Harrison), he is scorned by all those who once worshipped him. This also plays out in the political sphere as allegiance to one’s country. Those who call the nation into question, such as Colin Kaepernick, are ridiculed and shamed. If one breaks tradition in support of contrary beliefs, they are not welcome to participate in the liturgy again; traitors have no place on the field or in the stands. If one does not stand with Football or see things through Football’s point of view, Football cannot permit them to stay. When looking at the Gospels and seeing both the instructions from Jesus and the example of Jesus, we notice that it stands very much opposed to the narrative which Football (and sports in general) present to us. First and foremost, Jesus defines “success” very clearly: “‘Love the Lord your God with all your heart and with all your soul and with all your strength and with all your mind’; and, ‘Love your neighbor as yourself” (Luke 10:27. Also see Mark 12:28-34). Jesus never encourages his followers to be wealthy, in fact, he often condemns it (Lk 6:24, 16:19-31; Matt 19:16-24), and both the Older and Newer Testament feature many moments that condemn the wealthy and powerful. [v] In a worldview where success is love of God and neighbor, wealth and fame stand in direct opposition because those things can only be obtained through the trampling of one’s neighbor. While Football creates a hierarchy of experience based on wealth, Jesus welcomes all to sit at the table with him in communion, regardless of race, gender, or social standing. While Football demands that you give more for a better experience, Jesus offers himself in his fullness to those who seek him. Everyone at Christ’s table get the same quality of experience. Those who have higher social standing are told to treat those below them as equals (1 Cor 11:17-34), as Paul reminds us that there are no favorites in Christ and no believers who have “better gifts” than others (1 Cor 12:4-26). It does not matter where you come from, it does matter what you once believed, for “in Christ you have been brought to fullness” (Col 2:9). Even though we are encouraged to look at the world as though it does not have borders or levels, there are many who stand opposed to this message. By preaching this message of inclusion, Jesus faced the wrath of those who did not see the world as he did. Pharisees and other leaders who sought to maintain the status quo and separate the “clean” from the “unclean” challenged Jesus and ultimately handed him over to the Romans to be crucified. It is here where we see the greatest difference between the worldview of Jesus and the worldview of Football: when Jesus is attacked, he does not fight back. He turns the other cheek when they slap him (Matt 6:38-39), he allows the guards to take all of his clothing (Matt 6:40), he walks the extra mile with a cross he did not deserve to bear (Matt 6:41), and he forgives the soldiers who nail him to the cross (Matt 6:43-44, Lk 23:34). As Football screams at us to push back and fight against those who oppose us, Jesus lets his accusers win. The God of the universe lets us kill him. Think about it: as Christians, we claim that the greatest moment in human history is when a Jewish rabbi was wrongly slaughtered by an unjust empire. We claim salvation in a moment that others looked upon in mockery. He was crowned with thorns, not a Lombardi Trophy. There was no confetti, no speech, and no glory. While Football tells us that no matter how lowly you are, you can still be great, Jesus shows us that the greatest to ever walk the earth was also the lowliest. The one thing that Football does get right is that we need to show allegiance to our “team;” the problem is that it tries to convince us to follow the wrong ones. On Jesus’s team, we no longer are defined by the categories that Football tries to place us in. The world is no longer full of “opponents:” it is filled with neighbors. Enemies can no longer exist because Christ demands that we love them just as we do our allies (Rom 12:9-21). We are called to radical forgiveness and radical hospitality, welcoming all who come to us in need. We are not called to save and protect our lives, but to lay them down for the sake of Christ. We are called to be martyrs for his name and champions in the same way that he was a champion – death (Rev 2-5, 7:9-17[vi]). This “Team” requires full, unequivocal devotion, so much so that no other “team” is allowed to define us or shape our mission. Perhaps the most dangerous thing about Football is that it says we can keep our religion and our God. It does not condemn “Tebowing,” nor does it restrict the writing of Bible verses on eye black or apparel. It demands, however, that we adhere to its rules, regardless of the example which Christ set for us. It tells us that we cannot challenge its concept of “team,” for if we do, we are an affront to the whole system. It tells us that the only way we can achieve success is if we do the exact opposite of what Jesus instructed us. By joining Jesus’ team, we challenge every border and restriction that Football tries to place on us. By playing according to Jesus’ rules, we can no longer adhere to the rules of Football, for they are antithetical. By claiming Jesus’ victory, we necessarily claim defeat in Football. We cannot see the world according to Football if we want to live according to Christ. You cannot serve both God and Football. Please understand: I'm not telling you to stop watching football. I'm not claiming a boycott of the NFL or an abandonment of all sports. I have only hoped to show you that when attending a "church," pay attention to what is said and done. Football gives us subtle messages and makes claims that we could mistakenly adopt or synchronize with our faith if we are not careful. I believe that we are allowed to enjoy a football game, but we must be wary that we do not start thinking in Football's terms. If we are to be Christians, we must let Christ define the world for us. [v] See: All of the prophets, James, and Revelation, just to name a few. [vi] See Richard Bauckham’s Theology of the Book of Revelation for more details. It is one of the greatest books I have ever read.